It’s nearly 11 p.m. on a Monday night in the home locker room at Levi’s Stadium, and Colin Kaepernick’s national anthem protest is keeping his teammates from getting to the shower. His corner locker is surrounded by a crowd waiting to speak to a man who had precisely nothing to do with his team’s season-opening win over the Rams, and a few dirty, irritable and bruised offensive linemen — tired of pushing their way through bodies for the past three hours — are having none of it. A solution is proposed, and Kaepernick moves to the center of the room. The group, an ectoplasm of microphones and cameras, moves along with him. All around the room, men who made tackles and caught passes and scored touchdowns stand alone at their lockers, watching the show. He is practically shouting, strafing his eyes across everyone gathered before him. “At what point do we do something about it? At what point do we take a stand as a people and say this isn’t right?” It’s a remarkable scene. For the past two seasons, these same reporters and this same man engaged in a humorless battle with language. The guy who scored 38 on his pre-draft Wonderlic test — higher than Andrew Luck and Aaron Rodgers — gave the simplest and shortest answers to every question. He was detached and defiant, wounded and challenging, a man who seemed trapped by his profession. And now here he is, inviting questions and talking right through a PR guy’s attempt to end the discussion. Why Kaepernick? Why now? The story of his emergence as a symbol of protest is a well-timed snapshot of a world in which reasoned debate has dissolved into a screeching band saw of argument and discord. We’re constantly told we live in polarizing times, but it’s not the poles that are in dispute. We need a word that describes the complete absence of middle ground. 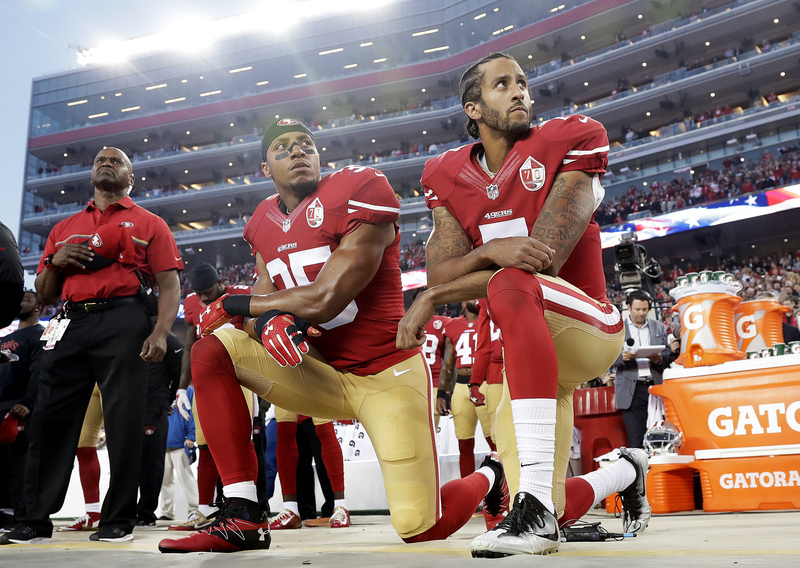 As soon as Kaepernick’s intentions were revealed — nobody noticed until he had sat through at least two preseason anthems — an entire ideology was ascribed to him. He was anti-American, anti-military, and in the most pustular of the internet’s lower intestines, it was suggested he was radicalized by a Muslim girlfriend. The issue, it seems, was never the issue; it was his suitability to be the one addressing it. He grew up as an adopted, biracial son of a wealthy white family. He had every advantage. He went from being a Super Bowl quarterback to a $12 million backup, and that word — backup — was fired with malice, meant to sting, as if the worth of a message can be gauged by playing time. But then teammate Eric Reid knelt beside him in the final preseason game in San Diego. 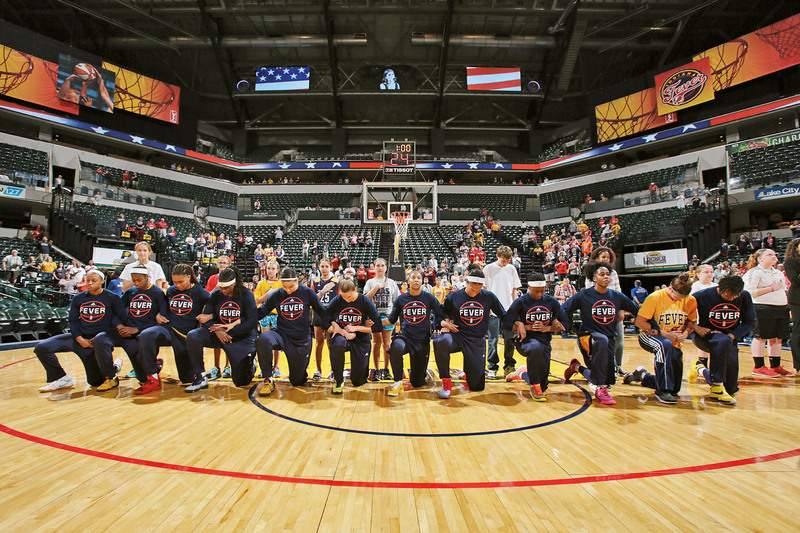 Soon, high school teams knelt. 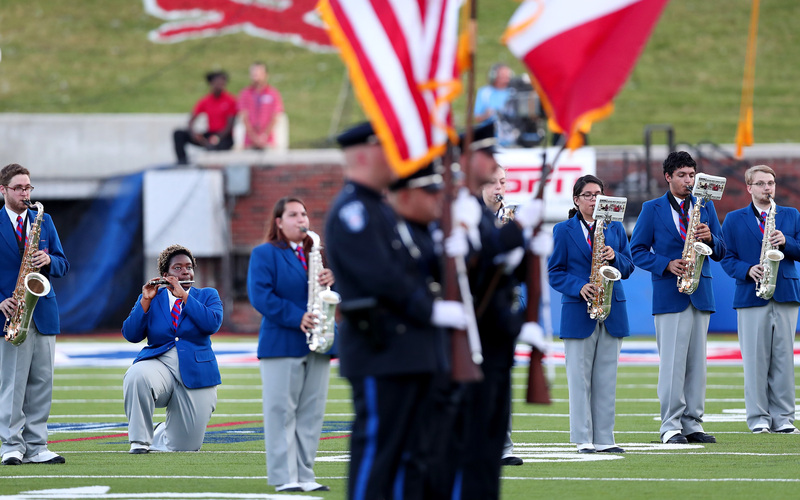 A high school band knelt — while playing the anthem. Peaceful protesters in Charlotte, North Carolina, facing police in riot gear, took a knee to link their cause with a quarterback who hasn’t taken a meaningful snap in nearly a year. 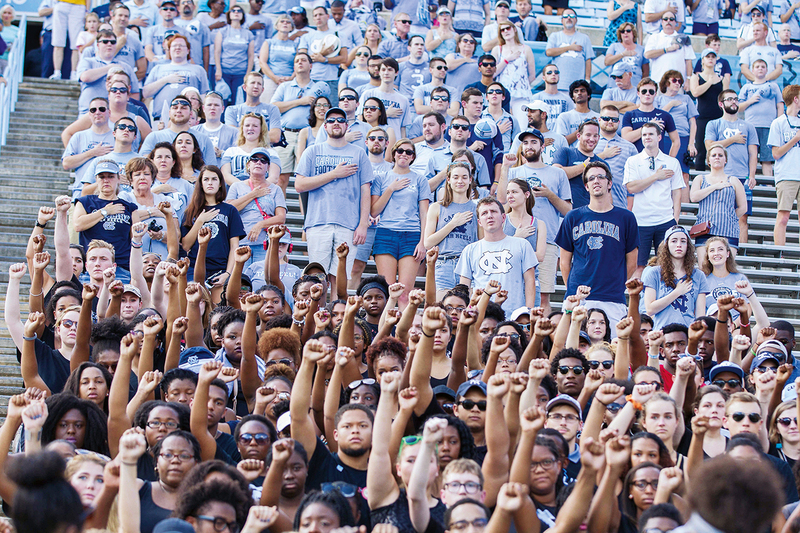 A gesture began to feel like a movement, and soon backup lost its sting. The gesture was intended to impose discomfort, and America’s grand systems were forced to respond. 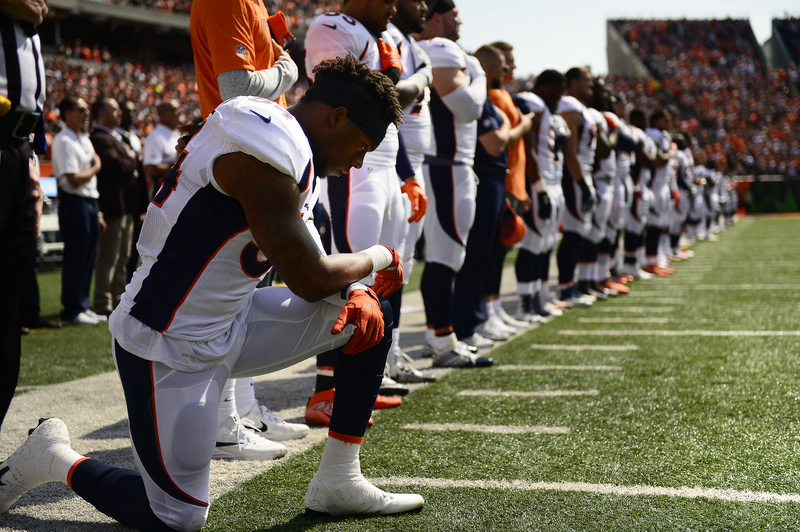 NFL commissioner Roger Goodell said something beige about players’ rights and patriotism. Donald Trump told him to find another country. The Seahawks, in a made-for-NFL-Films moment, linked arms in a team-building, trust-fall form of anti-protest that looked like the sideline version of neighborhood gentrification. In football terms, Kaepernick was dismissed as a distraction, that functionally vague term that suggests players are paid to be dutiful golden retrievers, chasing the ball until someone tells them to stop. 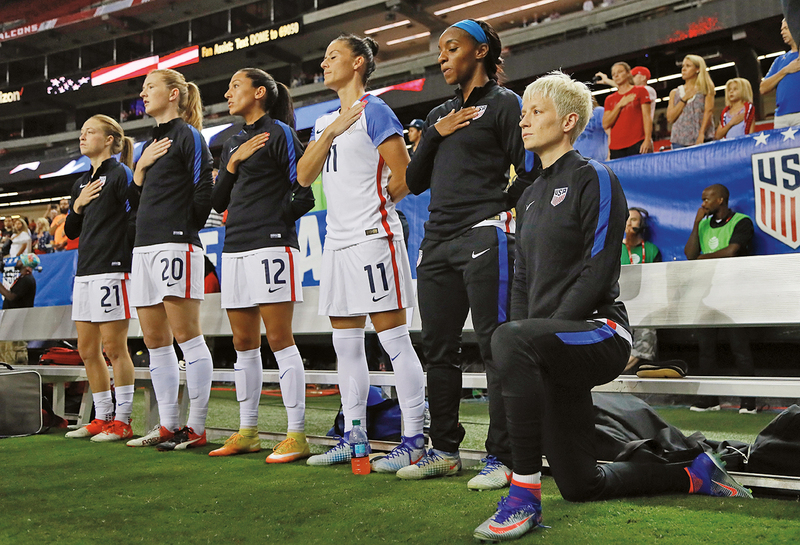 Under this construct, being part of a team and kneeling for the anthem are mutually exclusive; one negates the mere possibility of the other. There’s another, easier definition of distraction: something the team doesn’t want to be forced to deal with. These words: They sound generic enough. They could have slid by without much notice. But look closer. Zero in. Assume … barriers … race … where you’re from. Maybe those words connect to Turlock, California, an agriculture-and-railroad town that evolved into a semirural, semisuburban outpost for those willing to brave a twice-a-day Donner Party commute to escape Bay Area housing costs. Kaepernick grew up here, the adopted son of Teresa and Rick, a cheese-company executive. Turlock is wide and flat and blistering hot in the summer. What it isn’t, and never has been, is a popular place for African-Americans; there were 601 African-Americans among Turlock’s 70,000 residents in 2010. Or maybe the roots lead back to Pitman High School, where former football coach Brandon Harris describes him as “incredible in the classroom, incredible on the field, an incredible leader.” Everybody remembers the time Kaepernick let his hair grow out and his parents drove him an hour to the closest place that did cornrows. Does he remember the looks of his friends and teammates? The words that made it clear that it never occurred to them he would ever do anything that would outwardly proclaim his race? There’s a framed photograph of a post-touchdown Kaepernick kissing his biceps in the office of Anthony Harding’s gym in a metal warehouse in Turlock. Nearby, Main Street Footer’s, a hot dog spot, has redacted the name of the item formerly known as CK7. “I’m not one of those people to turn my back on somebody,” says Harding, who, with Kap, was one of three black players on Pitman’s team. Harding went on to play running back at Fresno State and is built like someone whose job is to stand in front of overweight people and inspire them to exercise. San Francisco 49ers safety Eric Reid (35) and quarterback Colin Kaepernick (7) kneel during the national anthem before an NFL football game against the Los Angeles Rams in Santa Clara, Calif. Even kids in a town with a Blue Diamond Almond plant and a poultry pathology lab listened to hip-hop. They all took the same classes, lived in similar neighborhoods, competed for the same girls. How could you distinguish yourself culturally? 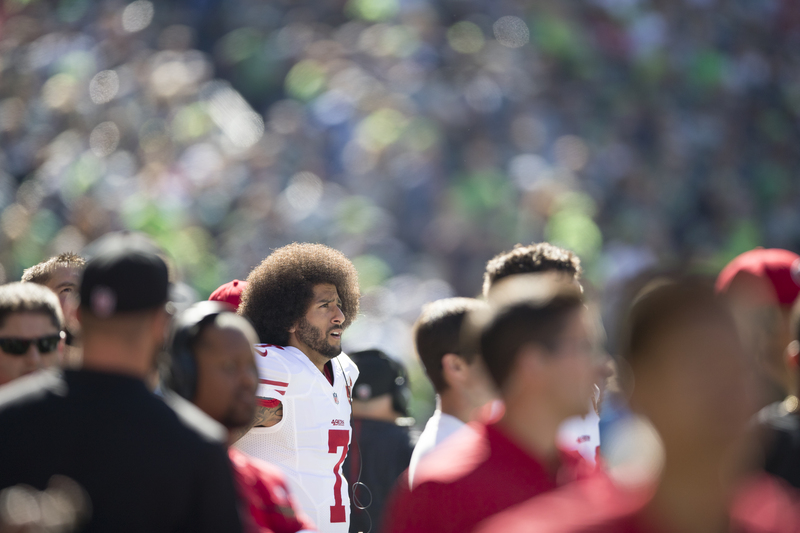 I ask Harding if he and Kaepernick talked about race, or belonging, or their unique place as high-profile black athletes in an overwhelmingly white town. He’s shaking his head as the question is being asked and says, “No. Never. Not at all.” I interpret the look on his face — half-amused, half-disgusted — as saying: We were kids, man, not characters in a novel. John Bender makes no apologies for his loyalty. On his phone, the contact for Kaepernick still says one word: Franchise. As Bender tells it, the call stuck with Kaepernick. He told his parents, who bought a season ticket for the woman and made sure it was the seat right next to theirs. So maybe it’s not what happened to him that causes him to kneel and speak out. Maybe it’s an accumulation of what has happened to everyone else. They used to count the words he spoke in news conferences. That’s how bad it was in San Francisco. For the better part of two years, Kaepernick’s public persona — perhaps dictated by coach Jim Harbaugh — deteriorated from outward defiance to barely concealed disgust. Back in Turlock, that was the guy they didn’t recognize: headphones around his neck, thousand-yard stare, monosyllabic answers. Harbaugh was out after the 2014 season, replaced by the inelegant and overmatched Jim Tomsula. Kaepernick played like someone with trust issues, either holding the ball too long — 28 sacks in nine games — or heading upfield after a cursory look at his receivers. He went from a Super Bowl quarterback to one who lost his job to Blaine Gabbert, whose specialty is the 3-yard pass on third-and-4. When it was announced that he would undergo season-ending surgery on his nonthrowing shoulder before Week 11 of last season, his motivation was questioned. How could he go from playing the role of Russell Wilson with vigor one day to ending his season the next? It’s easy to imagine that someone being told there’s more to life than football so many times eventually starts to believe it. Kaepernick has remained somewhat guarded — open but not particularly forthcoming. He considered and then politely declined a one-on-one interview for this story, saying his advisers recommended against it. (Repeated phone calls to family members went unreturned.) One of the few glimpses he has provided into his own experience concerns an incident in Reno when he and another African-American football player were moving a friend out of an apartment. He said someone in the mostly white neighborhood called the police on them, and officers entered the house with guns drawn. His feelings about the police, at least sartorially, have been evident for more than a year. In a feature on the fashion website Mr. Porter, Kaepernick is described as getting out of a white Jaguar wearing “blue, nearly knee-high socks adorned with cartoon piggies wearing cop uniforms.” The interview took place after the Cardinals beat the 49ers in Week 3 of last season. The socks, as described, are similar to ones he wore during a 49ers practice in August. “Yes, Mr. Kaepernick, you are the man to follow in the tradition of Paul Robeson, Jackie Robinson, Muhammad Ali and W.E.B. Du Bois, who were willing to face consequences, unafraid.” — message from the Rev. Amos C. Brown, pastor of Third Baptist Church of San Francisco, Sept. 4. Activism is not without its complications. On Sept. 3, it was announced by Third Baptist Church of San Francisco that Kaepernick would be speaking at its service the next day. A media contingent dutifully showed up to hear Brown say that Kaepernick’s training schedule had made him unavailable. After the service, in which Brown said, “If you’re familiar with Hebrew numerology, the number seven [Kaepernick’s jersey number] means completion, perfection, totality,” I ask the pastor if he felt uneasy elevating Kaepernick, still just 28, so soon. His words discourage further questions, but it’s fair to ask: How did this happen so quickly? Those same societal and technological elements that allowed for the instantaneous transmission of #SandraBland and #TamirRice into the public consciousness made Kaepernick’s protest a national flash point before he could refine a message. At the time of Brown’s service, Kaepernick was still in his beauty pageant phase. (He answered a question after the Chargers game by saying, “My dream result would be equality and justice for everyone.”) He was a few days away from announcing he’d donate all of his personal proceeds from his then-No. 1-selling jersey. 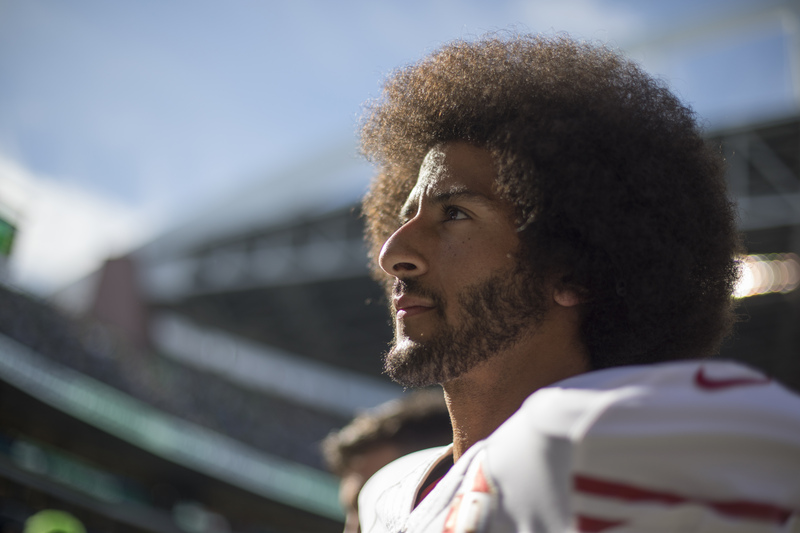 He was more than two weeks from detailing his plans to donate $100,000 per month for 10 months — a total matched by the 49ers — to community groups working to combat police brutality and racial inequality. I read Brown’s passage — the one connecting Kaepernick to Robeson, Robinson and Ali — to Kaepernick’s high school coach. Harris is quiet for a moment before making a sound like a wave approaching the shore. But as I watch Kaepernick direct the cameras and microphones to the center of the room, it becomes obvious: This isn’t pressure. Pressure was giving one-word answers that fit within the autocratic confines of his profession. Pressure was playing the role of the golden retriever. But now? Now he will be the one to spread discomfort. He will stand before you and dare you to ignore him. He will kneel and question and challenge the world to address the space between the poles. This story appears in the Great Debates issue. Pick up a copy on newsstands starting Oct. 7. Tim Keown is a senior writer for ESPN The Magazine and ESPN.com. A native of Pittsburgh, Pennsylvania, he grew up in Northern California and had a brief and inconsequential college baseball career.